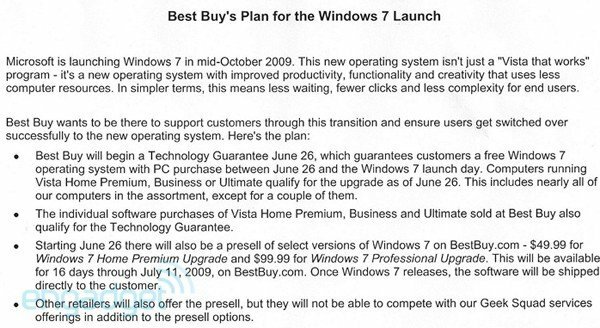 According to a memo leaked at Best Buy, it will offer customers a Windows 7 Home Premium Upgrade for $49.99 and Windows 7 Professional Upgrade for $99.99. When Windows Vista was launched the upgrade options were – Windows Vista Home Premium Upgrade $129.95 and Vista Business Upgrade was $199.95. Looks like Microsoft has decided to take quite an aggressive Windows 7 pricing strategy!